What an interesting week it’s been. The world and its sadnesses – capsizing cruise ships with pusillanimous captains have not exactly passed me by, but I find myself floating ephemerally on the surface of events these days. Being sixty must have something to do with it. I still want to drive a Ferrari, but slowly. We have yet another priest – the poor man delegated to serve us over Christmas slipped into a coma and passed away. 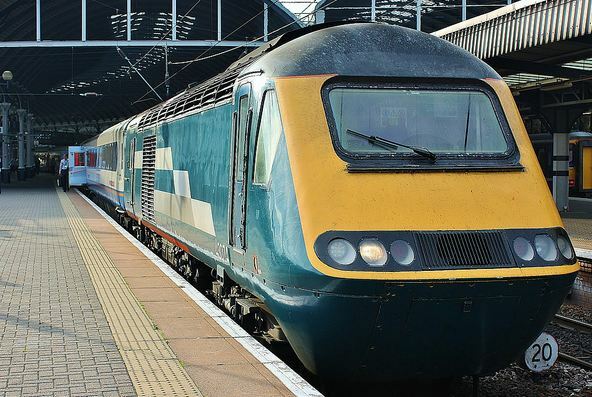 Another ‘father’ – how I hate that term – has arrived, who seems to have intelligence, resilience and the kind of churchmanship that will appeal to the more liturgically switched on. This does not, alas, include myself, being a brontosaurus in this respect, slow of thought and response. Nonetheless, there was an efficiency of delivery which I both admired and feared a little. We continue to wallow in a backwater of indecision about what we like to sing – as if God cares – why doesn’t somebody simply pull a few people together and just get it right. I play, drifting off to a little private island where I get to ring a doorbell at the the gates of the throne room, for which I am grateful. The older I get, the more that friends seem important. people who don’t just tolerate my noxious and unsettling presence, but those who are warm and unconditionally accepting. It’s been an interesting week since I have experienced this in a variety of different contexts. When I was a child, I separated out ‘church’ friends and everybody else. Everybody else were the martini drinkers and smokers of cigarettes whose lives were racier and more exotic and careless than my own. Church people were less forgiving but more reliable. In reality, their responses are remarkably similar. 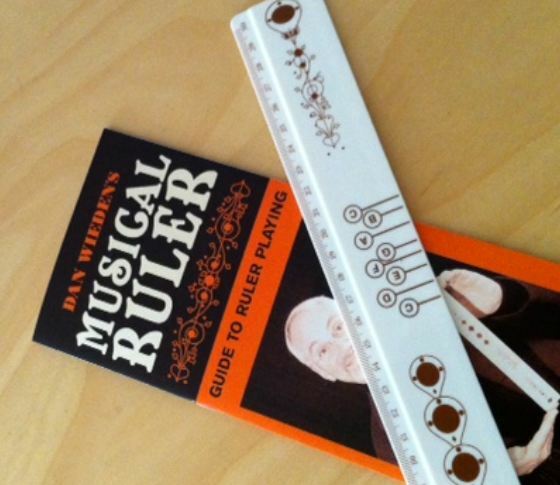 After lunch on Friday, a tiny child solemnly presented me with a ‘musical ruler’ plus instruction booklet – I can already play ‘She’ll be Coming Round the Mountain’ quite well, I think – whose resonant properties will probably find their way into my A level teaching. I had several birthday cakes, the first with some awfully good mulligatawny soup – its very familiarity redolent of a taste of childhood which almost brought a tear to my eye, of which the hostess (who knows me alarmingly well) was unaware – the last at a charity event last night. 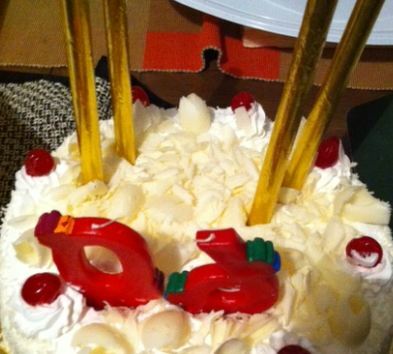 Friends brought a vast white confection topped with fireworks which almost fused the lights. Its very extravagance was a metaphor for how valued I felt at that moment. I don’t much care for heavily sweetened confection, but to decline would have been a bit like the Prodigal Son saying he didn’t much care for veal. A palliative nurse gets to witness a lot of earthly departures. Someone sent me a link which made me pause for a moment’s reflection. Its author was a nurse writing about people’s final, often sadly regretful wish-lists as they faced the greatest adventure of all, death, the biggest change of all. I am currently facing the possibility of change, a paradigm shift, a genuinely small wrinkle or shrug of eternity, insignificant to all but me and those whom I know and love. Life is full of small comings and goings. How we deal with them is determined by how we deal with ourselves when change, inevitable as it is, knocks on our door. Am I going to cower behind the sofa, expecting Freddy Krueger to be on the other side? Or, do I invite the stranger in. “I wish I hadn’t felt the need to work so hard”. I sometimes look back and recall that for so many who have gone before, life was ‘nasty, brutish and short’. Which particular roll of the dice caused me, this one soul among so many, to have arrived in the world at this time, where comfort, food and shelter are so freely available? And, why do I feel so driven to validate myself by working so abominably hard? For years, the whispering demon of ambition squeaked and gibbered as it sat on my shoulder, enslaving me. As I grew older, I came to see that a prerequisite of naked ambition is an ego so inflated that one can barely see over the top of it. Slowly, inexorably and hitherto incompletely, the whispers have faded and lessened and the promised glitter fades like shabby tinsel. The world will not cease to turn because people don’t understand Kepler’s Laws. The Universe will not cease to expand because I failed to explain the concept of space-time accurately. As I know myself better, the mists roll away and I know as I am known, which is ultimately a simple matter of perspective. Happiness is, ultimately, a choice. I think. Sticking fast to old habits and patterns, the ‘comfort of familiarity’ – can overflow into the emotional life thus I convince myself that I’m happy because I’m afraid of change when in reality I’m only barely contented. H’m.